I get the sense that lettuce is becoming a food trend. Seems that more and more food shows are incorporating plain old salad greens – from iceberg to romaine and arugula – into soups, sautees and other dishes. I believe the Brits are used to having peas with lettuce, which seemed strange to me until the doe-eyed Nigella Lawson demonstrated how delicious the combination can be. Or maybe I’m just extra alert to green-food trends now that I’m trying to eat more of them. 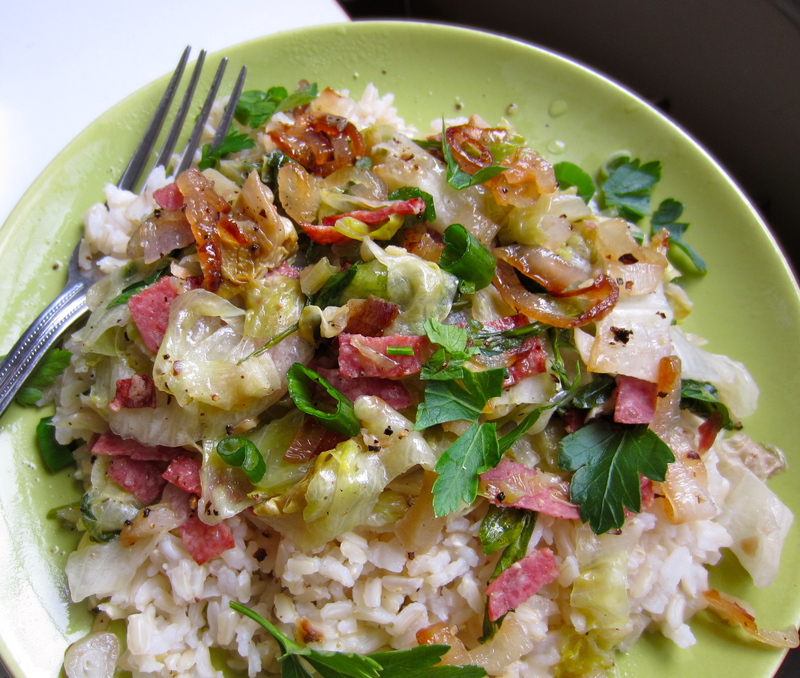 Anyway, I saw an interesting recipe in Bon Appetit for which lettuces are sauteed with spicy salami, garlic and ginger and served over brown rice, with fried shallots up top. It looked quite good and relatively healthy, so I decided to give it a try. Both Grant and I loved it! He favors anything with a strong ginger element, and I loved the cured meat mixed with the just-wilting lettuces and crispy shallot. My goodness, what can’t be improved with crispy shallots on top? I adapted this a little, but not too much. Get the Basmati rice cooking while you prep all your ingredients. Heat oil in nonstick skillet over low heat. Add shallots and cook, stirring often, until golden brown – 12 min. Remove to paper towels to drain and season with salt and pepper. Set aside. Increase heat to medium and add salami, then garlic, ginger and red pepper flakes. Stir until everything starts to sizzle and add 1/4 c. water. Increase heat to medium-high, add lettuces and saute until just wilted, 1-2 min. Season with salt and pepper. 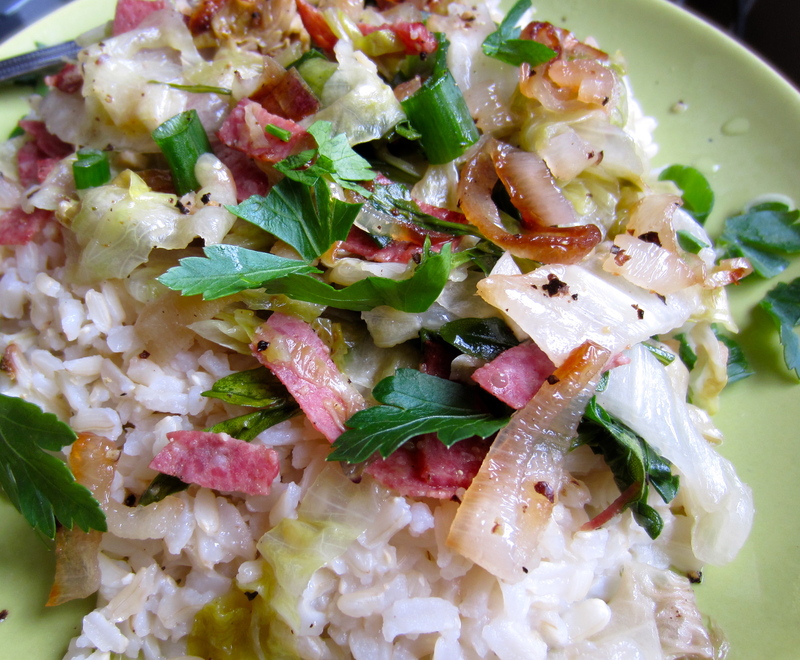 To serve, spoon lettuce mixture over brown rice and top with crispy shallots. I also added some green onions and parsley, just because I had them on hand. This recipe makes me want to try more with wilting lettuce into dishes – yum! They retain a little bit of crunch, but lose any bitterness. And it filled us up just fine. We had a cookie exchange/Secret Santa shindig with the girls at work. Everybody was asked to bring a dozen cookies, preferably something that reminded them of home. I guess I didn’t hear this last part because I went ahead and made cookies my mother never would have made growing up. But times have changed. Bacon continues to ride the wave of food-trendiness. You won’t see me with a “Keep Calm and Eat Bacon” tee shirt, but I like bacon as much as the next red-blooded American. Leave it to Martha Stewart to turn something as low-country as bacon into a sophisticated cookie that will wow your guests. The brilliant part is that you POUR THE BACON GREECE INTO THE BATTER. 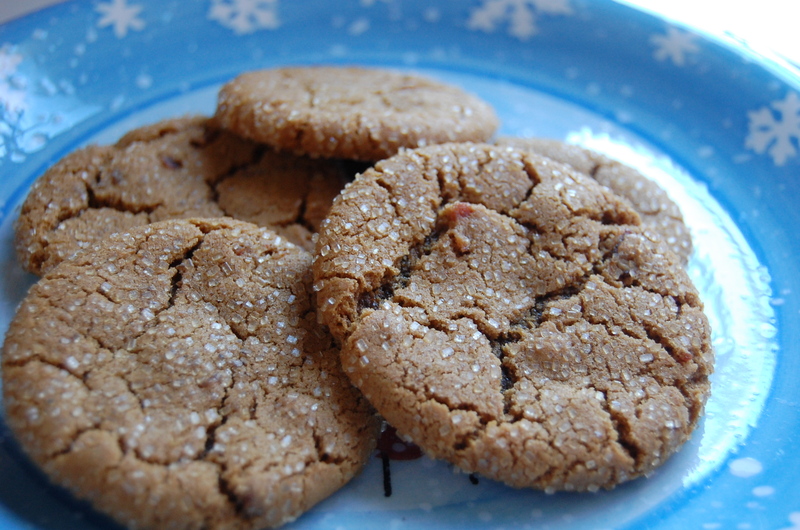 Don’t let your arteries get into a tizzy – this batter has way less butter to account for the bacon fat, so the resulting cookie is chewy and spicy like a ginger cookie, but with something extra – the smoky smell of the hickory-smoked sea salt you sprinkled on top, plus a savory bite that enhances the rest of the flavors. Set a large skillet over medium heat. Add bacon and cook, stirring occasionally, until the bacon bits are crisp and have released their fat entirely. Reserve the bacon fat (you want about ¾ cup, plus 2 tablespoons) and set aside the crisp bacon (about ¾ cup as well) on a paper towel. Let the bacon and fat cool. Mix the flour, baking soda, ginger, cinnamon, and salt in a large bowl. In the bowl of a stand mixer, mix the butter and brown sugar and white sugar until they become fluffy together, about 3 minutes. Add the bacon fat and mix well, about 1 minute. Add the egg and mix until well blended. Turn off the mixer and scrape down the sides of the bowl with a rubber spatula. Pour in the molasses and mix. On slow speed, slowly pour in the dry ingredients, mixing until just blended. Gently mix in the bacon bits. Scoop 1 T of dough out and roll into a 1-inch ball, then roll in the raw sugar to coat entirely. Put the balls of dough 2 inches apart on the baking sheet. Flatten the balls of dough with the palm of your hand, then top with a pinch of the smoked sea salt. Slide the sheet tray into the oven and bake until the edges of each cookie is starting to crisp, the tops start to crack, but the center is still soft, about 8 minutes. (Turn the baking sheet halfway through.) Do not be tempted to over-cook these. I would stick to 8 minutes at least for your first batch. These cookies do well when they are chewy in the middle. Allow the cookies to cool completely on a rack, about 15 minutes. 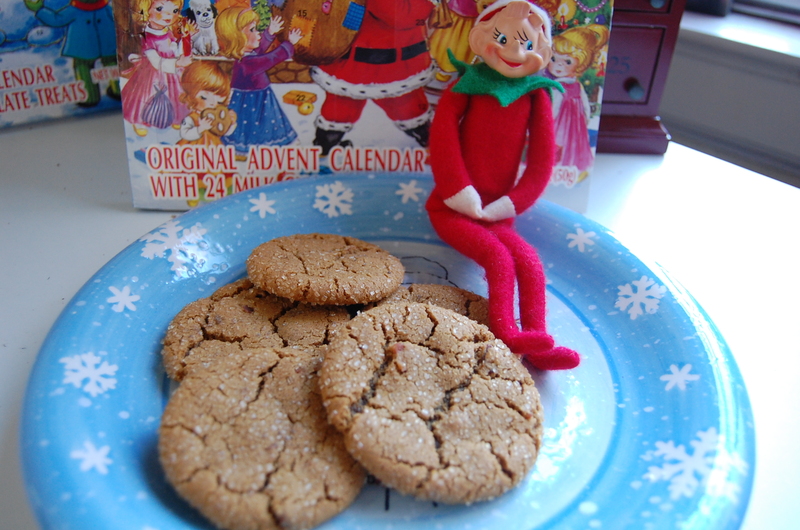 Then plate up … with an Elf on a Shelf! I never heard of the Elf on a Shelf tradition until I moved down here, but I love these little guys, hiding all over the house – Santa’s little snoops. While I baked these cookies, Grant poured himself some Makers Mark, which goes well with the smoky nibbles. 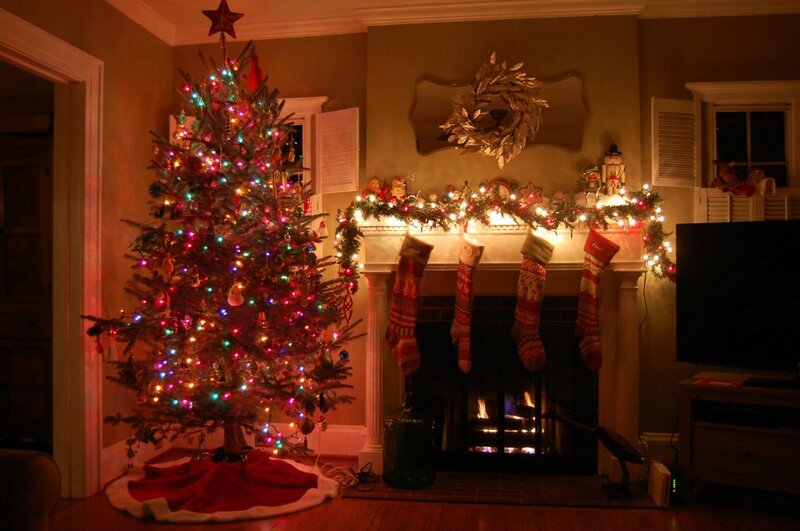 And we enjoyed a silent night. 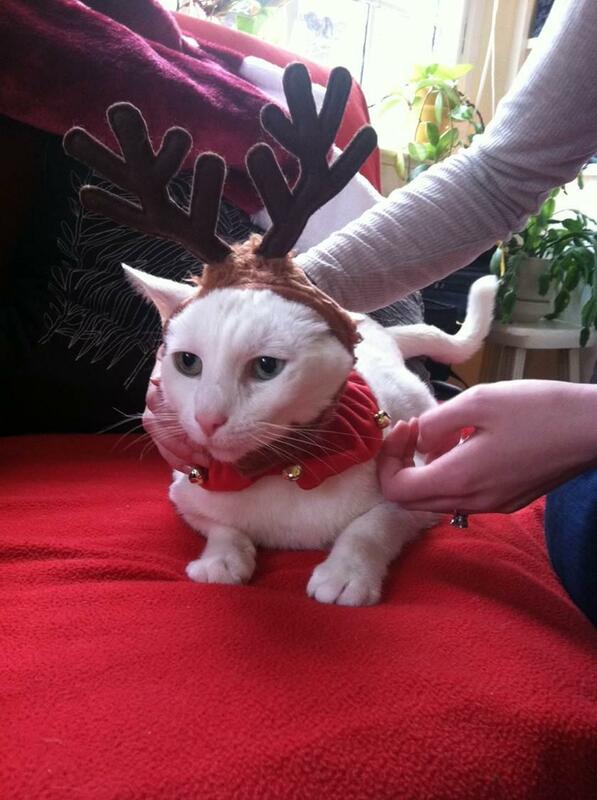 Here is the obligatory photo of my cat being forced to wear a reindeer outfit. Pomegranate seeds are like little rubies that burst with sour juice when you bite into them. When I was little, I loved popping them between my fingers, the purple spray going everywhere. While fun to play with, pomegranate seeds are a bit high-maintenance. Especially after I watched my mother make pomegranate rum as a child – the process of extracting the juice took forever. Nowadays, a savvy cook just buys the juice and uses the seeds as a garnish. Which is exactly how this dish works. Adapted from We Are Not Martha, the sweet glaze pairs perfectly with thick-cut pork chops. With the addition of fresh ginger, garlic and soy sauce, it has an Asian twist that is lovely. This is perfect with a fruity red wine. We served it along side mashed Yukon gold potatoes and garlicy steamed broccoli. In a medium saucepan over medium heat, combine pom juice, sugar, cornstarch and red pepper flakes. Stir until bubbling and thick, then remove and set aside. In a small bowl, combine garlic, ginger and soy sauce. Set aside. In a large skillet, heat 1 T olive oil over medium-high. Pat chops dry and place in hot skillet, then spoon half the garlic-ginger mixture over the meat. Cook for 5 minutes, then turn and spoon the remaining mixture over. Cook another 5 minutes, or until cooked through and barely pink. Remove chops from pan and keep warm. (Note: I had to pop mine in the oven at 350 for a few minutes to finish cooking – you don’t want the sauce to burn). 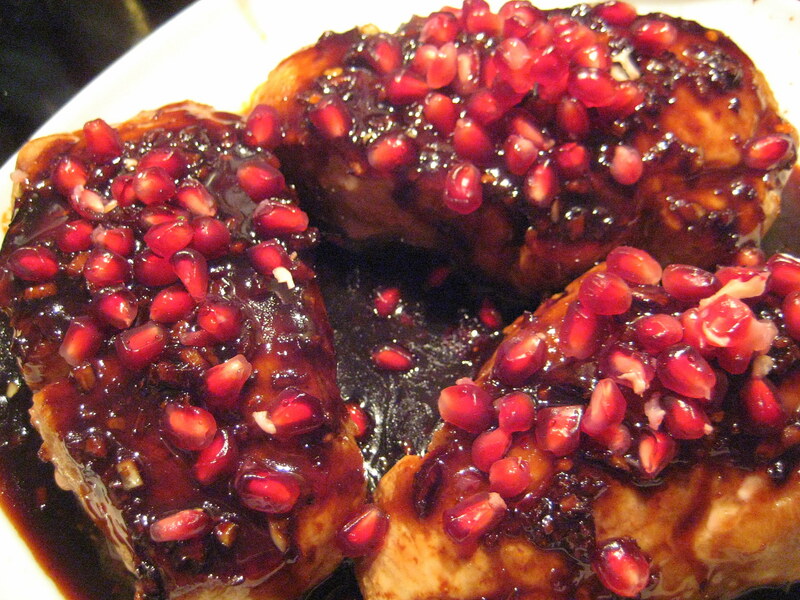 In the chop pan, pour a little pomegranate juice in to de-glaze, scraping up the stuck-on bits. 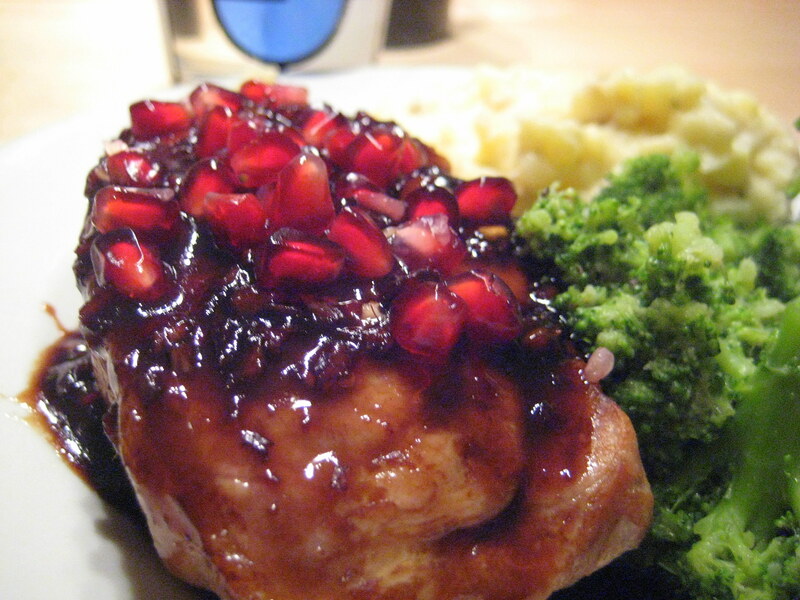 Off the heat, add the pomegranate syrup you reserved and stir to combine. The sauce will be thick and very dark with a deep, rich flavor. Just splendid. 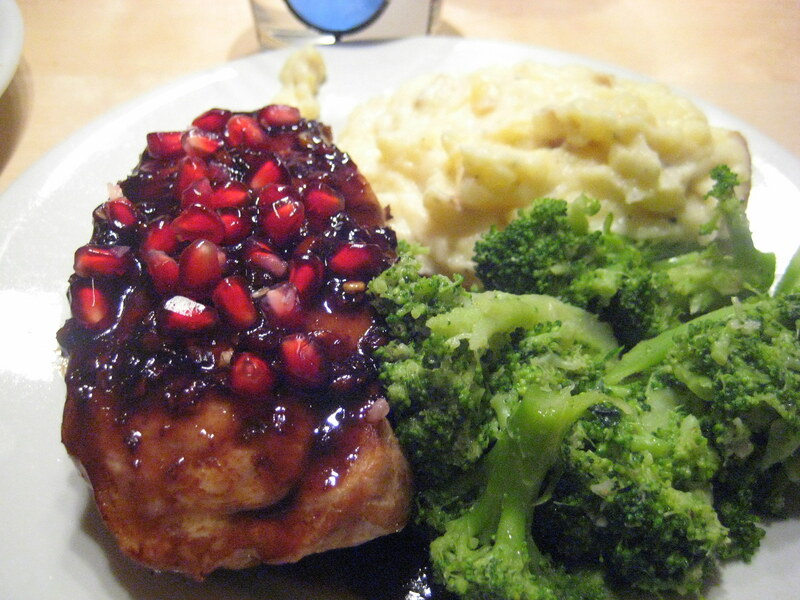 To serve, pour sauce over the chops and top with seeds. This was a fun meal to make that filled the house with wonderful smells. The sauce is good enough to eat with a spoon! I literally licked the plate and spoon and fork. I keep tuna and salmon in the only-good-in-sushi category. I’m not a huge fan of the cooked fish, finding it a bit oily and strong-flavored for my sensitivities. Raw, they are fine; cooked, it gets all wrong. I’m not sure what the solution is to cooked (not cured or smoked) salmon, but for tuna, I’ve found a way around the fishy weirdness with a good marinade and all-wood charcoal. Based on an Epicurious recipe, this proved to be a wonderful summer evening meal, served with a baked tomato-basil-mozzarella bread salad and tamarind margaritas… First things first. My dining companion manned the grill, starting with all-wood charcoal and one of those chimney things that you use to get the coals hot. It takes longer, but I could absolutely taste the difference – plus, who wants their food to taste like lighter fluid? Whisk first 8 ingredients in medium bowl to blend; season to taste with pepper. 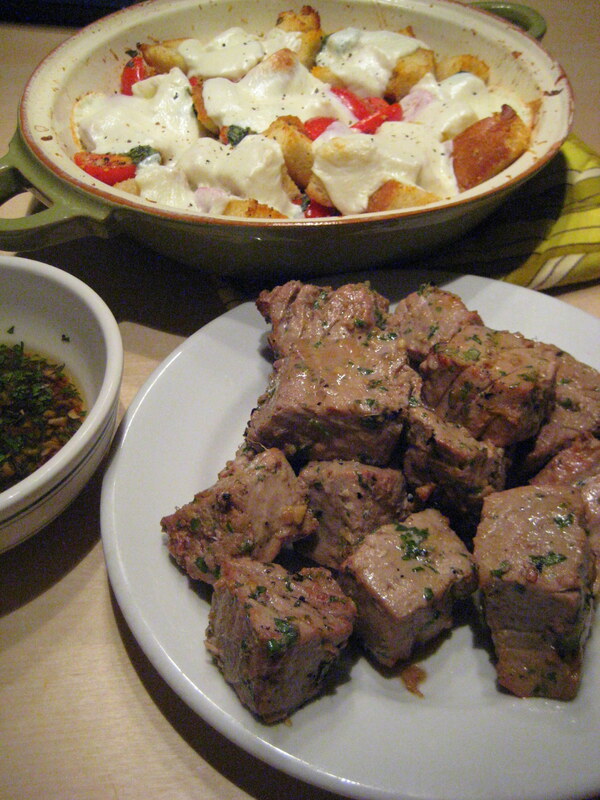 Transfer 3 tablespoons marinade to small bowl and reserve. 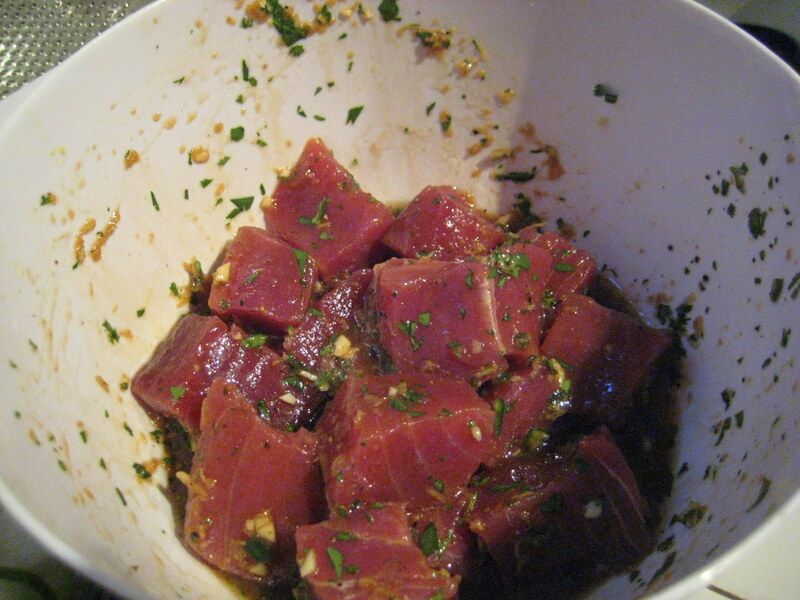 Add tuna to remaining marinade in medium bowl and toss to coat. Refrigerate at least 30 minutes and up to 45 minutes. Spray grill rack with nonstick spray. Prepare barbecue (medium-high heat). Grill to desired doneness, turning frequently, about 4 minutes total for medium-rare. Transfer to platter. Drizzle reserved marinade over; sprinkle with chopped cilantro. This tuna is soooo good, you won’t even believe it! That smoky taste from the barbecue, the ginger-soy-sesame combination, the heat from the chile, it’s all perfect. The leftovers are great served cold, over a salad or by themselves. I made a simple baked bread salad with heirloom tomatoes, basil, Parmesan, garlic and bread cubes baked with fresh mozzarella over the top. At work, we have lunch frequently catered and whenever we get The Carving Board, people go crazy for their Asian noodle salad: thin noodles with sesame and ginger flavors. After watching Ina Garten make her crunchy noodle salad a few times, I decided to try my own version of this tasty side dish. How wrong can you go with peanut butter, ginger, garlic, soy, sesame and scallions? You can add your own twist to these salads – for me, I added blanched broccoli and roasted chicken breast, which turned it into a nice little lunch meal as well as a hearty side dish. As with all pasta salads, this gets even better the second day and can be served warm, at room temperature or cold. Preheat the oven to 400. Place chicken breasts on cooking sheet and rub with olive oil, then sprinkle with salt and pepper. Bake until tender but cooked-through, about 25-30 min. When done, remove from skin and bone and shred into bite-sized pieces. Meanwhile, bring another large pot of salted water to a boil, add the broccoli, return to a boil, and cook for 3 to 5 minutes, until crisp tender. Drain and immerse in a bowl of ice water. Drain. 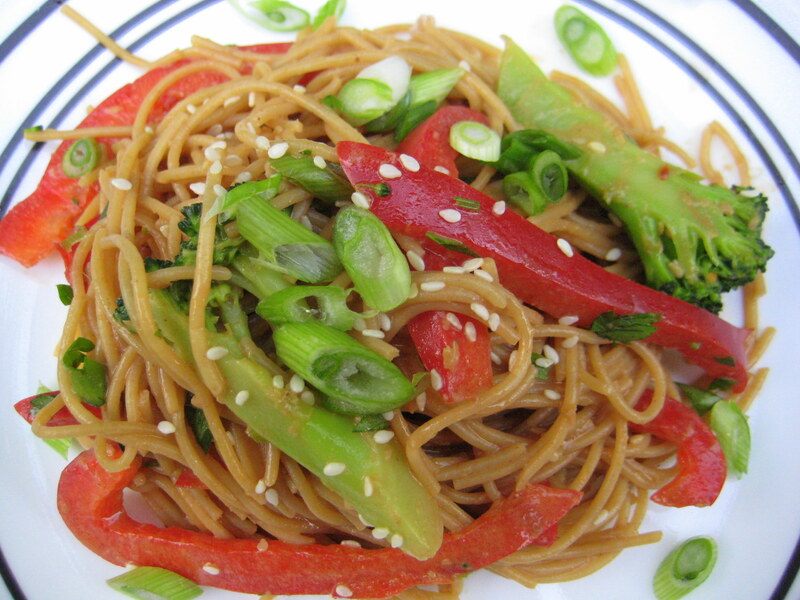 Combine the spaghetti, broccoli, chicken, peppers and scallions in a large bowl. Pour the dressing over the spaghetti mixture. Add the remaining 1 tablespoon of sesame seeds and the parsley and toss together.